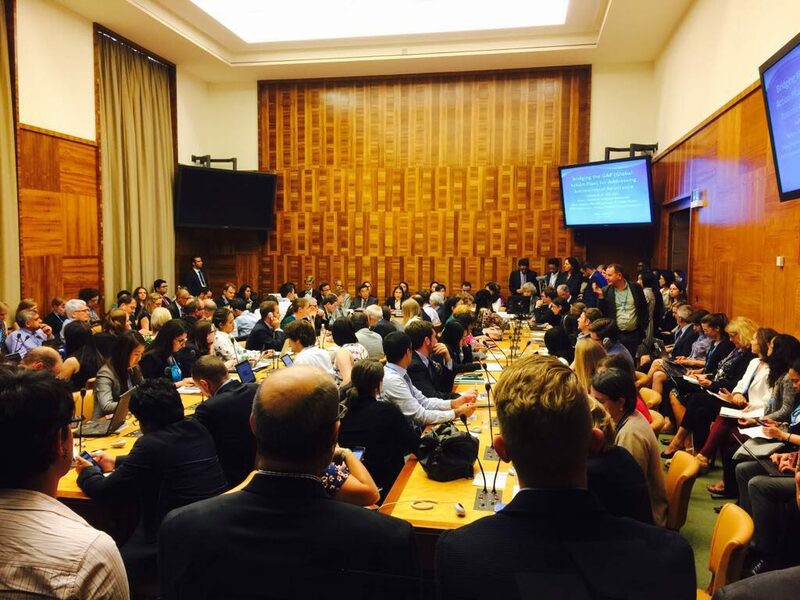 The side event on Antimicrobial Resistance taking place in a packed hall of Palais des Nations at the World Health Assembly. Dr. Viviana Munoz of the South Centre chaired the event. At the side-lines of the 70th World Health Assembly session in May 2017, the South Centre supported and chaired a multi-stakeholder dialogue between civil society and governments, with the speakers calling for urgent global action to tackle antimicrobial resistance. The side event “Responding to the Challenge of Antimicrobial Resistance (AMR): Perspectives of Civil Society, Intergovernmental Organizations and Developing Countries” was held on 22 May 2017 at the Palais des Nations in Geneva. The event was sponsored by Médecins Sans Frontières (MSF), Drugs for Neglected Diseases initiative (DNDi), Health Action International (HAI), and Medicus Mundi International Network (MMI), and was supported by the South Centre and ReAct Action on Antibiotic Resistance. Viviana Munoz of the South Centre chaired the event. The Centre played a key role in organizing the meeting. Below is a report of the event. Civil society is becoming increasingly active in advocating for more effective and coordinated actions to tackle the crisis of antimicrobial resistance (AMR). Senior representatives of leading global CSOs spoke in a side event at a packed hall (with many participants having only standing room) at the World Health Assembly, and stressed the need not only for urgent action to control the misuse of antibiotics, but also that the new antimicrobials must be made affordable and accessible to all. CSO leaders from Médecins Sans Frontières (MSF), Drugs for Neglected Diseases initiative (DNDi), ReACT and Medicus Mundi International Network stressed that the poor and the low and middle income countries (LMICs) suffered the most from AMR. It is imperative that as more funds are poured into research and development (R&D), the outcome or new antibiotics, other antimicrobials, vaccines and diagnostic tools must be affordable to LMICs, especially their poor. The Chair of the event, Viviana Munoz of the South Centre, also shared these points in her opening and concluding remarks. Representatives of the Health Ministries of India and Thailand also made presentations of their countries’ plans to combat AMR; they brought up issues of implementing the plans and called for more assistance from WHO. DNDi, ReACT and MSF emphasized that R&D efforts to counter AMR should adhere to internationally agreed principles including affordability, effectiveness, efficiency and equity and de-linkage. Several speakers stressed the importance of adhering to the principle of de-linkage – the prices and sales volumes of antibiotics are not linked to the cost of investment in R&D –, and that therefore new innovation models based on de-linkage should be put into practice. The problems of access to medicines and innovation models that are consistent with access were the main highlights of the CSO presentations, which said these models were to ensure benefits arising from better stewardship of new and existing antibiotics. Viviana Munoz, South Centre, welcomed participants to the event and noted that the outstanding tournout was an expression of the broad support for coordinated global action to tackle AMR. She noted that AMR is a multifaceted problem. For example, AMR is linked to misuse and excessive use, but there is also the problem of access to antimicrobials. Moreover, AMR is linked to human use, use in animals and impact on the environment. On the positive side, AMR is now firmly placed on the global agenda, and increasingly on national health agendas. There is recognition of the need for a holistic approach to the problem that involves multiple sectors and actors. With this, she noted great pleasure to moderate a panel composed of CSOs and people that are working hard to make a difference and whose engagement on the AMR agenda is essential, as they have an extraordinary capacity to inspire and mobilize collective action, and a deep understanding of the root causes of the problems relating to AMR. She highlighted that the South Centre is convinced that there is a need to give more voice to civil society to engage in and help shape the AMR agenda, if we really want change. Anthony D. So, Director, IDEA (Innovation+Design Enabling Access) Initiative at the John Hopkins Bloomberg School of Public Health and Director, ReAct – Action on Antibiotic Resistance Strategic Policy Program, suggested that the problem of AMR should be approached from a systems perspective, considering the inter-related elements of (1) innovation, (2) access and (3) stewardship. Dr. So highlighted the need to curb the non-therapeutic use of antibiotics and phase out the use of certain antibiotics in food animal production such as colistin, which is a last-line treatment in human medicine. He noted that a larger volume of antibiotics is not used in humans but in agriculture and aquaculture. Dr. So further elaborated on issues around prices of antibiotics. He noted that the idea of rationing antibiotics through higher drug prices is not an effective way to ensure rational use. Infectious diseases do not skip the poor and fall more heavily on those who cannot afford antibiotics. He also noted that if courses of new antibiotics could cost thousands of dollars, we should begin to wonder how we will ensure access and stewardship from such an innovation pipeline. Dr. So also talked about how push incentives for new antibiotic drugs (e.g., CARB-X, the European Union’s Innovative Medicines Initiative, NIH, BARDA and the U.S. biodefense program) address the key scientific bottleneck in the R&D pipeline, but existing efforts are insufficient and must better address de-linkage as well as conditions for access and stewardship. However, he explained that CARB-X has only $350 million dollars in commitments, but the needed expenditure in incentives is billions of dollars. He underscored the need to focus the incentives and that when policymakers and industry call for billion dollar market entry rewards “it may be too much, too late” since those market entry rewards may focus the public’s resources on the wrong part of the pipeline. On the animal health sector Dr. So talked about the importance of phasing out non-therapeutic use of antimicrobials, and to invest in developing alternative sustainable agricultural practices that help transition farmers and food production away from the intensive use of antibiotics. He also mentioned the need to change retail and institutional procurement practices and the need to engage consumers in demanding products without routine use of antibiotics. In his concluding remarks Dr. So emphasized the need for an “AMR Watch” of civil society organizations that could contribute with monitoring governments’ development and implementation of the National Action Plans as well as the intergovernmental organizations and other key actors, and making them more accountable. Michelle Childs, Head of Policy Advocacy, Drugs for Neglected Diseases initiative – Latin America, highlighted the need to implement and adhere to internationally agreed R&D Principles to guide innovation and access for AMR. These include the principle of de-linkage of prices and sales volume of antibiotics from the cost of R&D. Ms Childs spoke on the role of guiding principles on research and development (R&D) and stressed that any initiative should focus on the public health priorities with an emphasis on global needs. Ms Childs emphasized the need to ensure the implementation of globally agreed key norms and principles to ensure innovation and sustainable access such as: affordability, effectiveness, efficiency and equity as well as the importance of de-linkage – investments in R&D not linked to returns from sales volumes or prices. Ms Childs also pointed out the importance to ensuring sustainable financing at the national, regional and global level. She stressed the need to continue exploring new incentives for innovation such as push and pull mechanisms based on agreed priorities, principle of de-linkage and conditions to ensure sustainable access. Other important elements she mentioned were the need to identify R&D needs and gaps, to have a clear priority setting mechanism, coordination, sustainable funding and the core principles of: affordability, effectiveness, efficiency, equity. Ms Childs also mentioned the recently created Global Antibiotic Research and Development Partnership (GARDP) which is a not-for-profit R&D organization that will develop new treatments for bacterial infections. GARDP is a joint initiative of the World Health Organization (WHO) and the Drugs for Neglected Diseases initiative (DNDi). She stressed the importance of an urgent, comprehensive, global and public health-driven response to this growing problem and to ensure that the needs of patients and health care providers are at the center of any response. Ms Torreele also referred to the challenges caused by drug resistance in patients with TB, malaria, HIV/AIDS and other infectious diseases. She described how MSF in 2015 treated more than 20,000 patients with TB, of which 2,000 had MDR-TB. This could just be the tip of the iceberg of an estimated 580,000 people with DR-TB worldwide since most who are infected are undiagnosed and untreated. Ms Torreele added that one of the biggest challenges for the medical teams is the lack of appropriate diagnostics. Thus there is a need to equip doctors and nurses with the right diagnostics and treatment tools to help them determine types of infection and whether the standard drugs still work. She mentioned other key issues in the AMR response which include: health system strengthening, improving medical practice and the need to increase access to vaccines such as the Pneumococcal Conjugate Vaccine (PCV) and rotavirus vaccines. “Increasing coverage of these vaccines could dramatically reduce the use of antibiotics. But high vaccine prices are a key barrier today to increasing vaccination, especially in middle-income countries,” she remarked. Ms Torreelle stressed MSF’s mandate to save lives and treat infections and therefore it took seriously the need to have affordable access to diagnostics and treatment tools, new and old and future ones. She said that “medical innovation is only relevant if the resulting products are available and accessible for those in need.” TB was mentioned as an example of one disease where new drugs have recently become available but less than 5% of patients that could benefit from these new drugs currently have access. She remarked that the public health challenges caused by AMR are not exceptional but linked to the global health challenges caused by a society that relies on high prices and monopolies to pay for innovation, which causes both a lack of access to existing health technologies as well as lack of patient-driven innovation. She also mentioned the importance of the recommendations and findings in the recent UN High Level Panel on Access to Medicines report and the need to use them. Garance Upham of Medicus Mundi International Network and Vice-President of “WAAAR”: World Alliance Against Antibiotic Resistance, stressed that AMR infections spread like epidemics do. This partly occurs because of the lack of adequate infection, prevention and control (IPC) systems. She mentioned that more than 20 countries in Europe do not have good IPC systems and therefore this is not an issue that only affects low or middle income countries. She pointed out that IPC systems would be beneficial in the animal sector since it would help prevent sick animals from infecting others animals. Also, hygiene practices in farms are an effective method to prevent disease in animals more than using meta-prophylaxis antibiotics. She also observed that untreated or badly treated wastes from the pharmaceutical industry, fruits and vegetables industry, hospitals and health care centers are dumped into the environment releasing antibiotics and exacerbating resistance. She emphasized the need to invest in clean water, sanitation systems and proper waste treatment as preventive measures that would reduce the need to use antibiotics in the first place. The side event also heard from two discussants: Mr. Lav Agarwal of the Ministry of Health and Family Welfare in India and Dr. Nihima Sumpradic of the Ministry of Public Health in Thailand. They presented on their countries efforts’ in addressing the AMR problem, and the challenges that remain particularly on implementation of the national plans. They called on WHO to provide further assistance to developing countries. Marc Sprenger from the WHO AMR Secretariat noted that civil society would be invited for dialogue and interaction with the members of the UN-level Interagency Coordination Group (IACG) that was established in March 2017. In the open dialogue, other CSOs made interventions, including International TB Union, TB Alliance, HAI, Oxfam, Health Care without Harm, Save the Children and KEI. This article was edited by Viviana Munoz and Martin Khor. Viviana Munoz is the Coordinator of the Development, Innovation and Intellectual Property Programme (DIIP) of the South Centre. Martin Khor is the Executive Director of the South Centre.